Our double sided upholstered office partition screens provide an attractive and colourful addition to any working area offering greater privacy and noise reduction. They are ideal for creating multiple private working areas in open office environments or for meeting pods and coffee areas in receptions or busy common rooms. 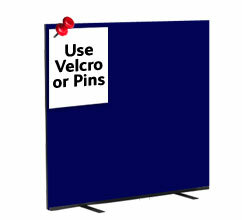 Schools and colleges often use them as classroom dividers or poster display screens. And our dividers are regularly found in libraries where they make quiet reading areas. And they can be moved and reconfigured at a later date to suit your changing requirements. Our range of screens start from just £96.00 with fast delivery for many colour options. The screens are available in a selection of heights and widths including 1200, 1500 and 1800mm tall options. The standard screens are supported by a pair of steel support bases providing stability in busy working areas. The office screens can be linked together in straight lines or set at 90 degrees to create booths and cubicle areas and double up as useful and Velcro and pin friendly display surfaces. 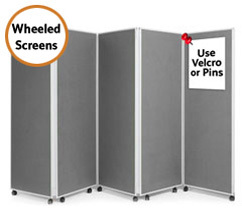 Both our standard office screens and office partition screens are available with lockable castors, the later being supplied with wheels as standard. The partition screens have a narrower 560mm wide double sided board which are ideal for fast setup and efficient flat storage. Do you need more information about our office dividers or have you got a custom requirement? Contact us at sales@ral-display.co.uk or call us on 0116 2554640.